Poach the chicken breasts: in a sauce pan, bring to a gentle boil the soy sauce, ginger pieces, and enough water to just cover the meat. Once the water starts to boil, immediately turn off the heat, cover the pan, and let it sit for 20 minutes. Lift the chicken breasts from the liquid, and once they are cool enough to handle, shred the meat using two forks or your fingers. Reserve. Heat the oil in a heavy pan, saute the shallots until barely soft, don’t let them get golden. Add the carrots and celery, season with salt and pepper, cook for about 5 minutes over medium-low heat, stirring every now and then. Add the chicken stock (or water), the potatoes, cover the pan and simmer until the potatoes are beginning to get tender. Add the cooked rice and the chicken, cover the pan again and simmer everything together for 10 minutes over medium-low heat. Squirt a little lemon juice, adjust seasoning, and serve. Poaching the chicken very gently in the mixture of soy and ginger makes the meat tender, juicy, with just a hint of ginger flavor. If you like a more assertive ginger taste, grate some and add to the carrots/celery mix. And, speaking of carrots and celery, they will be very evident in the soup, so take the time to beautifully dice them. It is a simple soup, but small details make it special. I like to add freshly ground black pepper and a little more lemon juice in my own bowl right before indulging in it. 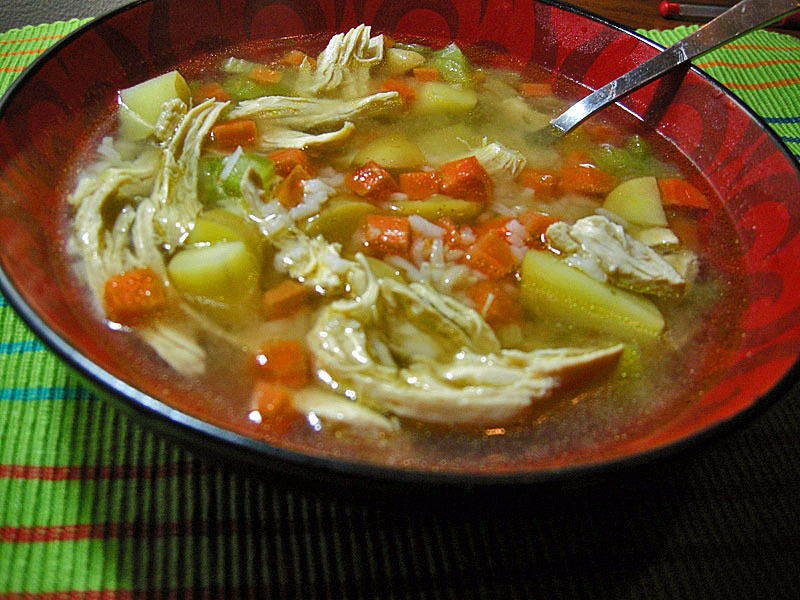 Ooh I am a sucker for health restoring chicken soup, yes please, please! I’m brazilian and,our canja does not contain any soy sauce,ginger or celery! The recipe is quite simple: chicken,rice,onion,garlic,potatoes,carrots,bay leaves,pepper and salt.After is madded you can add cilantro and spring onion if desired,that’s it!! !